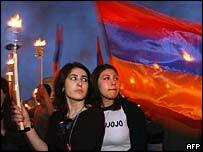 Mr Kocharyan hopes the US will now fully recognise the "genocide"
Armenia's president has welcomed a vote by US lawmakers backing the description of the mass killings of Armenians by Ottoman Turks after 1915 as genocide. 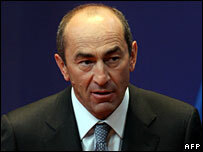 Robert Kocharyan told reporters he hoped the vote would lead to "full [US] recognition... of the genocide". Earlier Turkish President Abdullah Gul denounced the vote. Turkey has always denied any genocide took place. The White House has also been critical, expressing fears Turkey could stop co-operating in the "war on terror". The non-binding vote, passed by 27 to 21 votes by members of the congressional House Foreign Affairs Committee, is the first step towards holding a vote in the House of Representatives. Divisions within the committee crossed party lines with eight Democrats voting against the measure and eight Republicans voting for it. President Bush had argued against a vote in favour of the bill, saying "its passage would do great harm to our relations with a key ally in Nato and in the global war on terror". Turkey is a regional operational hub for the US military, and some suggest access to Incirlik airbase, or other supply lines crucial to US forces in Iraq and Afghanistan, could be cut in response. The row has also erupted as US fears grow of a Turkish military incursion into northern Iraq to neutralise Kurdish separatist guerrillas there, who continue to cross the border to ambush Turkish troops, reports the BBC's diplomatic correspondent Jonathan Marcus. Speaking after talks with EU foreign policy chief Javier Solana, Mr Kocharyan praised the committee vote. "We hope that this process will lead to the full recognition by the United States of America of the fact of the Armenian genocide," he said. Mr Kocharyan also appealed to Turkey to join Armenia in talks to restore bilateral relations, reported the news agency Associated Press. Wednesday's vote was received angrily by President Gul, who made a statement late in the evening accusing US politicians of "sacrific[ing] big problems for small domestic political games". "This unacceptable decision of the committee, like similar ones in the past, is not regarded by the Turkish people as valid or of any value," Mr Gul said, according to the Anatolia news agency. Correspondents say the committee's vote means that only a change of heart by the Democrats, who control Congress, can now stop a full vote on the bill. The Senate Foreign Relations Committee is expected to take up its version of the resolution in the future. Prime Minister Recep Tayyip Erdogan has meanwhile confirmed that the Turkish parliament could discuss a motion as soon as Thursday that would authorise incursions into northern Iraq to hunt down Kurdish PKK separatists. The move comes after an escalation in attacks by the PKK killed almost 30 soldiers and civilians in just over a week. The government is under immense pressure though to act, but Washington has warned Ankara against any unilateral moves that would destabilise Iraq even further. After the Armenian vote in Congress, correspondents say, Turkey will be far less inclined to heed instructions from the US on anything.